FEAST YOUR EYES ON FIVE! ≈ Comments Off on FEAST YOUR EYES ON FIVE! The enormity of constructing a new condominium in Toronto is amazing, and when preserving heritage components on a site is involved, it is even more astounding. Next time you are in the area of Yonge Street south of Bloor, take a good look at construction progress on FIVE Condos at St. Joseph. Graywood Developments Ltd. and Mod Developments Inc. have done a spectacular job of installing support trusses, structural steel and soil anchors to brace the historical façade of the 1880s warehouse buildings that will house new retail venues for the development. 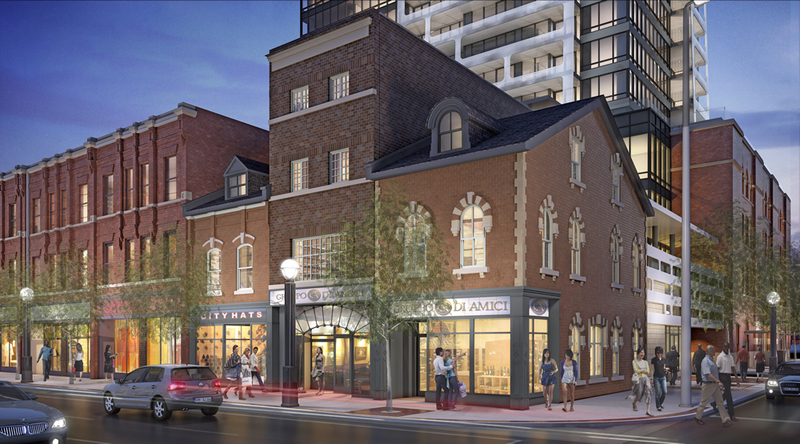 The developers are working with Hariri Pontarini Architects for the exterior of the new building, and ERA Architects for the restoration of turn-of-the-century details and iconic brickwork. This is the largest retention of a building facade ever undertaken in Toronto, and you simply have to see it to believe it. The entire urban neighbourhood is being rejuvenated, and FIVE Condos is an important part of the evolution. When complete, FIVE will be a 45-storey tower and five-storey podium that encompasses several former addresses on St. Joseph and St. Nicholas Streets. You can take a closer look at this landmark project at www.fivecondos.com.